A world first: Integrate your Fröling solid fuel heating system into your Loxone Smart Home to achieve a demand-driven boiler control system that is based on Loxone Individual Room Control. It’s an overcast Sunday morning. The cloud cover means that the house doesn’t have any solar energy heating the house through the windows. In the bathroom, the required temperature matches the actual temperature. In the living room, it is 2 degrees cooler than the required temperature and the bedroom is warmer than the required temperature. There is a demand for heating so that the living room can be warmed up, meaning that a high flow temperature is required. The boiler needs to get fired up! The afternoon sun is shining. The solar energy is sufficient to keep the rooms warm. This means that no heating is required. The flow temperature is low. In the evening, the required temperature in the bathroom is higher than during the day, the bedroom has cooled down to a comfortable 19°C. The living room is at comfort temperature. This calls for a low level of heating to gently increase the flow temperature. The Fröling Extension can be put to use both in homes and in larger buildings. 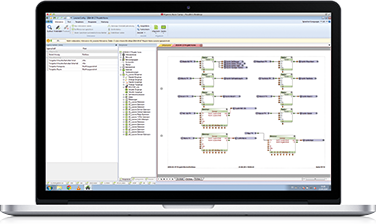 Only one Fröling Extension is needed to manage and control up to 18 heating circuits, 8 boilers and 4 buffers. 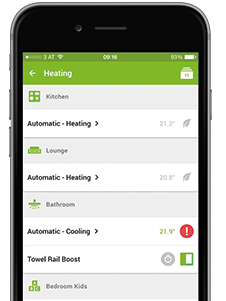 Just one glance at the Loxone Smart Home app is enough to keep you informed about the readings from and status of boilers, buffers and/or heating circuits. Anytime and anywhere, you can keep an eye on things. Notification of faulty. Respond quickly. By integrating your Fröling heating system, you can be informed if there is a fault or if a threshold value has been reached, either via an email, a phone call, a flashing light in your Loxone Smart Home – you can even use the new Music Server to provide a spoken notification. 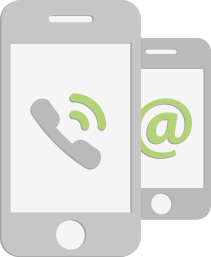 This means you will be able to respond quickly. 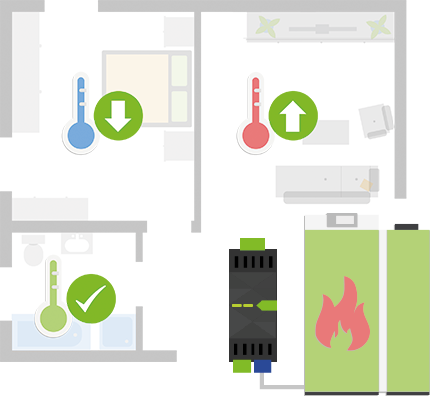 The new Fröling Extension means that our Loxone Partners will be able to easily integrate the Fröling heating system into your Loxone Smart Home. 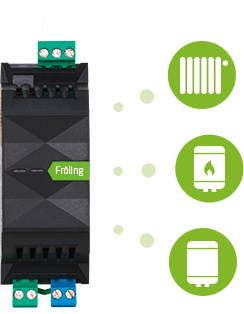 Loxone Config has a new Fröling block ready and waiting, making it simple to configure your intelligent boiler control system. 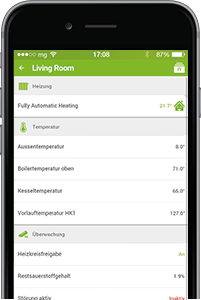 The Loxone Smart Home app means that it is easy to monitor your heating remotely – whether you are on holiday or just upstairs! A convenient solution to give you peace of mind.